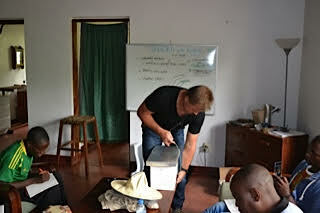 Ted, ensuring that trainees are suited up well before inspecting hives and harvesting honey during the hands on “practical” session. Clean extraction of comb honey is shown during the last day of the training where we focus on processing and packaging of honey. As you see very few tools are needed in this process. 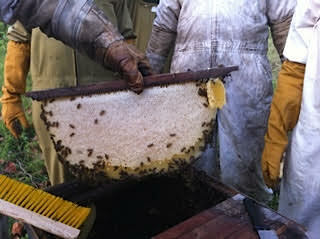 Both brood and pollen must be removed from the comb to get a nice “finished product”. 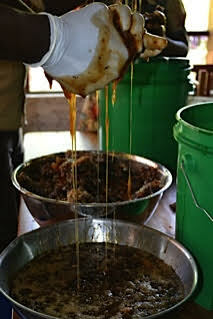 Honey will sell well if it is processed and packaged cleanly. 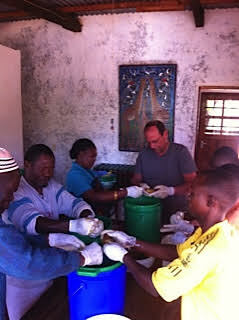 Co-ops of African beekeepers should be formed to work together in the ordering and transporting of good packing materials. African bee: Apis Mellifera Scutellata. Of the three varieties of East African honey bee (Litorea, Monticola and Scutellata), Scutellata produces honey in large quantities and is also the most widespread. 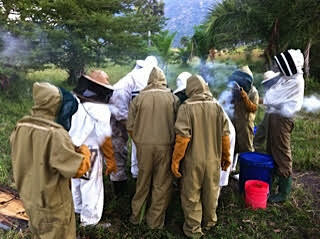 Trainees inspecting a hive in SW Tanzania. 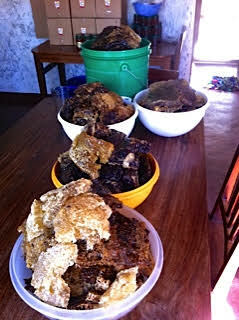 Another way of processing raw honey is by packing it as “Comb Honey”. 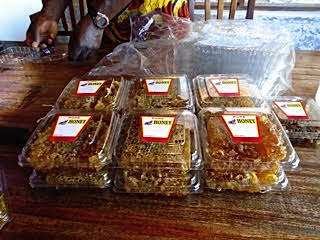 It is considered an “Honor” to give raw honey in the comb to guests in most of East Africa. It is very sought after by many in rural and urban areas alike! Bowls of raw comb honey awaiting pressing. 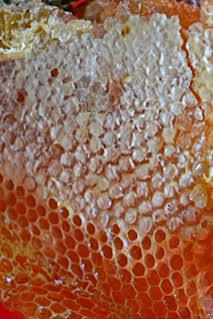 The darker honey combs have been part of the brood chamber at one time and the queen has laid her eggs in them. Since bees pupate they leave their chrysalis in the cell giving them a darker color. All wax cells are great receptacles for honey and bees will use those that were part of the brood chamber or virgin comb to store their honey. Showing the proper way to hang hives using grease to protect against ants as well as a scale to monitor when the bees are gathering honey stores. A two inch swath of grease placed on the hook the hive is hanging from will ensure that Siafu ants do not get into the hive causing the bees to abscond. Note: the kilogram scale is optional. A settling tank should be used to store “pressed honey” for 24-48 hours before bottling. Since everything in honey is lighter than the honey itself. 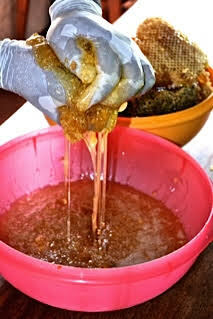 The bits of wax cappings and other lighter refuse will rise to the surface leaving raw pure filtered honey on the bottom to be taken by the beekeeper through a food grade Gate Valve like the one pictured. The “theory” aspect of beekeeping is very important. 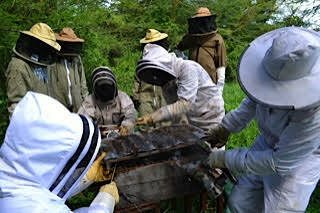 It is essential that all African beekeepers know how a colony of bees grows and interacts together. The first of our training sessions is on “theory”. 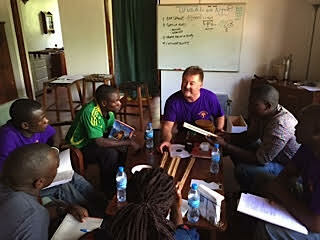 Ted has lived in Tanzania for 25 years and teaches comfortably in both Swahili and English. 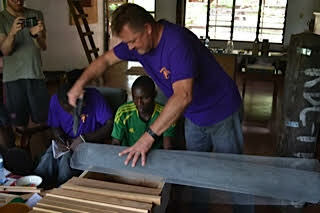 Trainees are taught to make wax starter strips for attaching to the bars in their hives. All aspects taught are adaptable for any one using the most ordinary of tools. Fredrick, with a starter strip of bees wax attached to his bar. Fitting a strip of bees wax in the groove on a top bar. It is afterwards “attached” with hot wax. 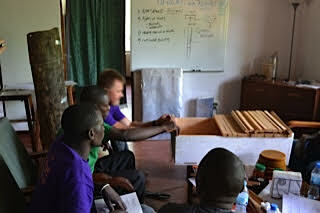 Lighting smokers and the purpose of smoke while harvesting is taught to all the participants. Leucas Nyassae is the primary flower responsible for our May-June nectar flow. 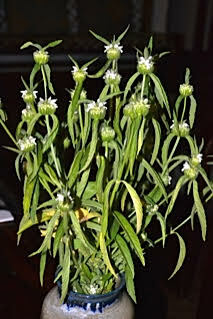 It is important that beekeepers know what flowers are responsible for producing their honey. 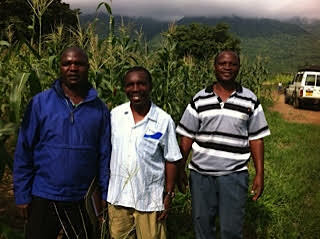 Ted and Eliamu Mulungu representing Tree of Life at the ECHO East African Symposium held in Arusha, Tanzania. 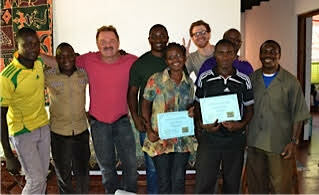 Ted taught the training sessions related to African Beekeeping. For an additional cost protective suits, sample hives and smokers are available for anyone who would like to purchase them. 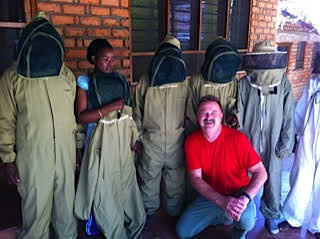 The making of such suits and equipment should fuel a “cottage industry” where ever the beekeepers are located. 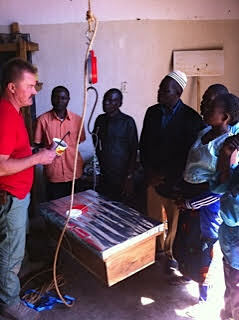 This equipment is easily replicated and can provide additional income for carpenters, tailors and tin smiths. 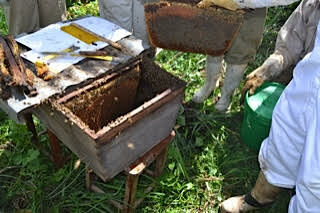 A partially filled frame on the end of this honey super is being shown to participants at the May-June training. This is a modified Langstroth hive. Beautiful African honey comb. Notice the cells are partially closed off with wax cappings. 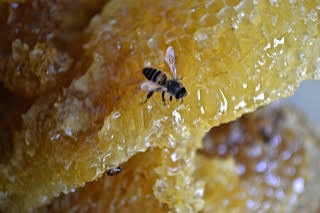 While consuming honey (the carbohydrate) in the hive the bees secrete wax from the wax glands located on their abdomen. They use this wax for all the building and construction that they do. Wax is an important and marketable item extracted from comb. 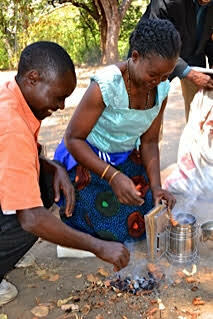 Together with Eliamu Mulungu visiting Manyoni, Tanzania honey producers. 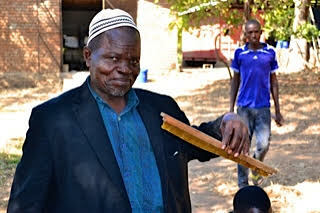 These men and women make their living with African bees. 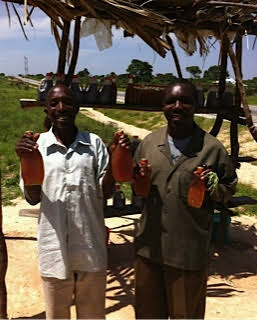 This beekeeper Adam (on left), sells honey all year long from two honey flows in May and November. 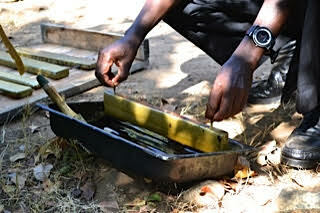 Songea trainee holding a mixed honey/brood comb. 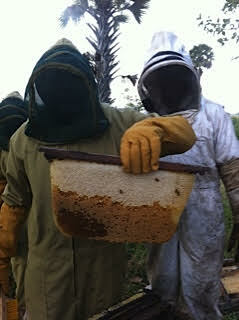 Here a solid “fully capped” comb of honey is taken from one of the top bar hives during the practical. 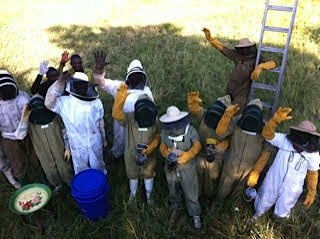 A group of trainees preparing to go to our bee yards to take part in the practical aspects of African beekeeping. 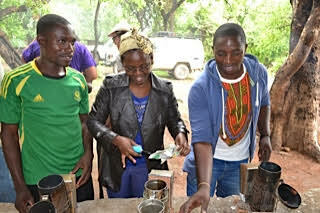 Moses Simsokwe, Eliamu Mulungu, and Jericho Mugalla, Tree of Life leaders that have a passion to see others understand how to utilize African honey bees to increase their annual income. Ted explains, how you use a “catcher box” to obtain strong occupations. 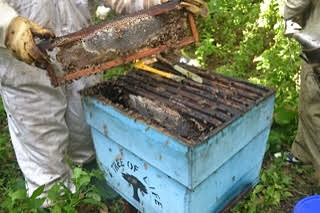 Pressing/crushing dark forest honey from the comb. 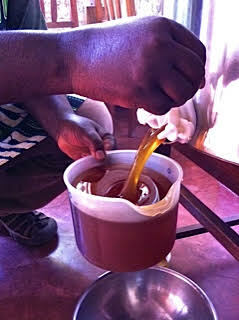 Pressing honey from its comb in preparation for the settling tank. This honey taken during our November 2015 training session is much darker (dark amber) than our May-June honey. Nectar, the source of honey, comes from flowers. Each species of flower produces its own kind of nectar. Honey which develops from different flowers looks, tastes and smells wonderfully unique. The darker the honey is, the more minerals it contains. The November 2015 trainees came from different regions of Tanzania and one from as far as Senegal, West Africa. The last honey comb before the brood chamber. This is a strong colony with a healthy queen. Opening a top bar hive together with our November 2015 Trainees. 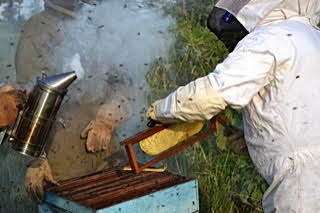 Giving a puff of smoke under the cover to move the bees back. 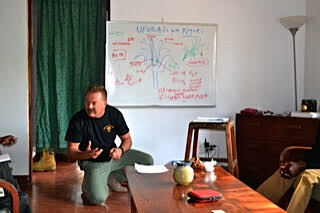 Ted, teaching about the importance of adhering to “bee space” dimensions in the construction of hives. 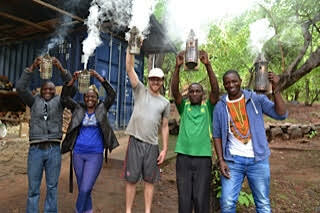 After discussing the purposes of smoke in beekeeping, everyone gets a chance to light smokers. 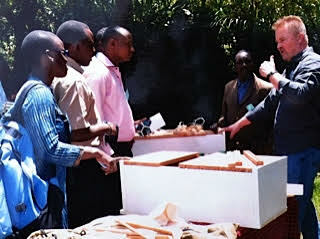 Hives, suits and smokers are available for purchase from Tree of Life ltd. 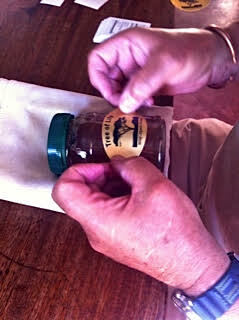 Preparing a coffee wire “queen excluder.” All materials for beekeeping in Africa can be found or made in Africa! 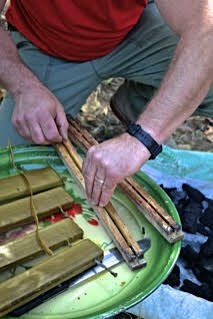 Preparing a “queen excluder” for top bar hives using coffee wire. Lighting their smokers. Block plane shavings provide and excellent fuel for the smokers.